Results and top performers from Day 3 of the 2019 Australian Under-18 Championships being held in Townsville, Queensland. For all the information from Day 3 of the competition including draws, ladders and top performers, click here. A number of close games in the morning session set up an exciting day of competition in Townsville, headlined by our first overtime clash of the tournament. 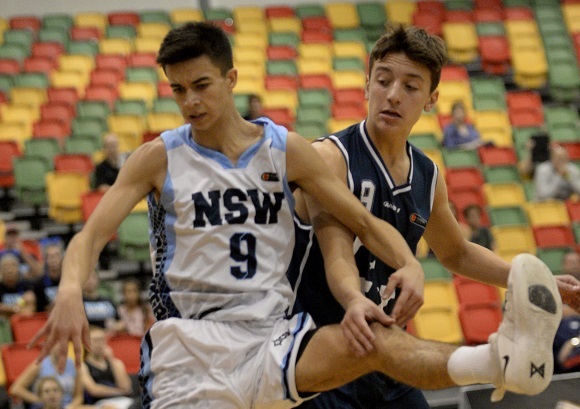 Vic Country battled NSW Country in Pool B for the Under-18 men and the lead did not exceed single digits throughout the contest. The Vics did own an eight-point lead late in the third term before Evan Kilminster (15 points) and Zak Simons (13 points, 15 rebounds) scored 12 of NSW Country's last 14 points in the final term. Dyson Daniels (14 points, 13 rebounds, six steals) and Keith Robinson (15 points) nailed important three-pointers though to send the game into the extra period where Patrick Ryan (26 points) came up big with six points as Vic Country secured an 85-84 victory. Vic Country then backed up later in the day in a battle against QLD South with both sides entering the clash undefeated. The Vics again got the job done though, succeeding 106-102 as five players scored in double-figures, led by Robinson's 31 points to outshine Mojave King's 30 points and Blake Jones' 18 points and 19 boards. There was another nail-biter in Pool B for the women and Vic Country and QLD South were involved again with a late charge from captain Grace Ellis (13 points, 11 rebounds) and Katie Deeble (13 points) seeing QLD South fall just short, 65-67. Vic Country now sit atop Pool B but alongside SA Metro who are also 3-0 while NSW Country are not giving them much breathing space, sitting just a game behind. In Pool A, only Vic Metro remain undefeated but they face a challenge today against second-placed NSW Metro while Pool A for the men sees NSW Metro and Vic Metro also setting the pace with 3-0 records. Media Day for the Kevin Coombs Cup will be held today before competition tips off tomorrow.